It's been a long time coming and still a bit more to go (bars I have ain't going to cut it). Mock up looks good so far. Front axle and spacers from an RC51 work with the CBR front wheel (think it was '04-05 wheel, '06-07 CBR might be the same). Went with the CBR wheel because it's three spoke and matches the stock rear close enough for now. 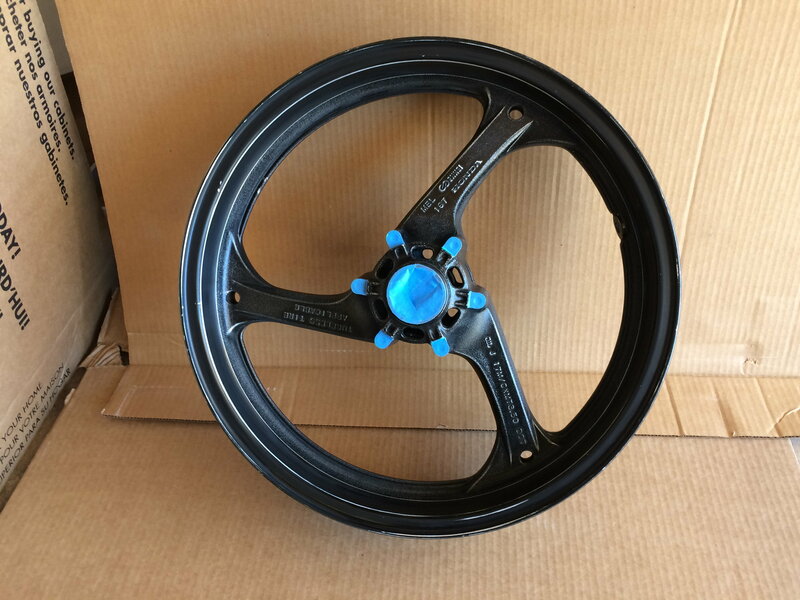 Also finding an SP2 front wheel is not worth, to me, the time and money. According to a chart EBC has for rotor dimensions the offset between the RC rotors and the CBR rotors is .25mm different (CBR is more). I don't know if that means the distance across the hub between the mounting surfaces for the carrier are different or what. The CBR wheel measured 117.18mm between carriers mounting points. Anyone have an RC wheel they can measure?? I have calipers mounted for test purposes. Stock VTR, no pads and there is a slight bit of interference. I suspect that it's because the rotors are larger and rubbing on the calipers. I haven't spent the time to know where. I would have mocked up with the calipers I'm going to use (954) but they are on the bike currently. The rotors "look" centered on the calipers, but my eye is not calibrated to .25mm (.0098"). Will it even make a difference if it is off that amount? Subbed. Maybe someday I'll be cool. Finally got serious about doing the fork swap and went at it this afternoon. Old forks off, old triple off, all ***** bearings races in. Started on the relocation brackets for the radiators. Looks like the 954 bars are going to work at least temporarily. Waiting on some new rad hoses and thermostat. When those come in I can put the carbs back on and button all that up. Still have to swap the tire from the old rim to the new rim. Hopefully all the control lines will be long enough. Wow I'm not the worlds best wrench but any fork swap I've done have not seemed to require any fiddling with the carbs or other fuel stuff. 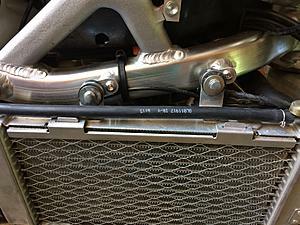 Also on the cbr1000rr swap I didn't need different coolant hoses. I like to take the scenic route. Or take a whole bunch of stuff apart and leave it for a couple of months and then see if I remember how everything goes back together. Really I decided that all the rubber in the cooling system is now 20 years old, and I had to pull the carbs to replace the over flow bottle, I would replace everything while in there. 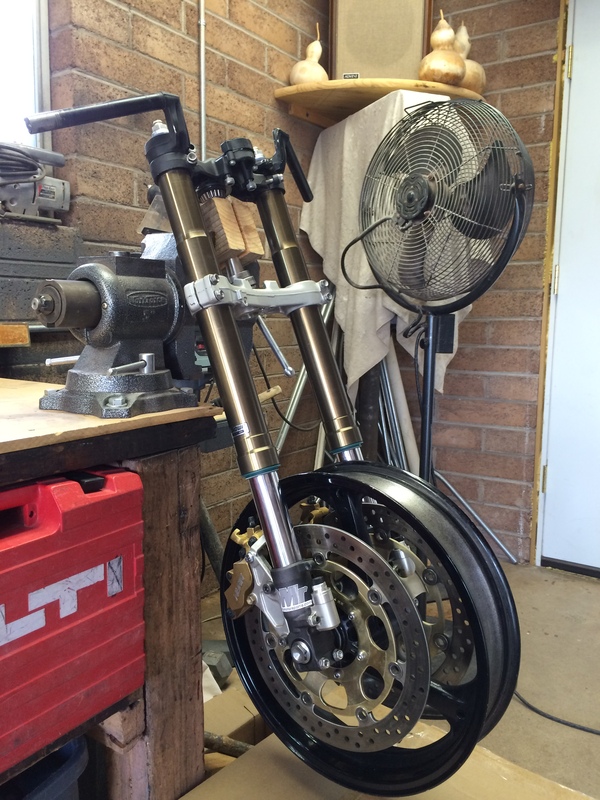 One of the side benefits of this swap is the stock SH forks, wheel and brakes freed up for another project. It's an '81 Goldwing that was given to me. Needs lots of love. The SH front end should make an easy fix for the very tired Wing. Don't plan on keeping it when done, so the less I spend the better. Who knew how many variables there are in a frankenstein fork swap. Probably everyone but me. Because I went with a CBR1k front wheel, I have a difference in axle diameters. 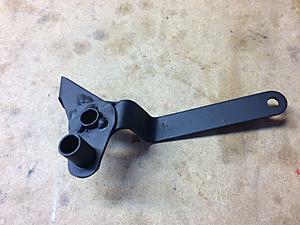 RC axle 22mm, 1k 25mm. Not only are the ID of the bearings different the width is also different, and in the wrong direction. RC 47x22x14, 1k 47x25x12. So just trim the spacers to fit? well the seals with the 22mm ID are 1mm wider, at 8mm. Now we have the seal proud of the hub by 3mm. I don't like it. The simple solution would be to get bearings in 47x22x12. Well they don't exist, that I've found anyway. Did find seals in the same width as the 1k seals, 7mm. So now down to 2mm proud of the hub. Experimented with one of the old seals removed from the wheel. Put it to the bench grinder and removed 1mm of width. If I make a jig I think I can do evenly enough to work. Maybe I can 2mm off and not f'it up. While I wait for more parts I can install all the new hoses and thermostat that arrived yesterday. 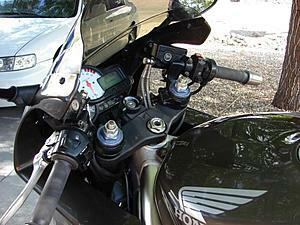 Oh yeah, 954 clip-ons will not work above the triple, at least with brake/clutch remote reservoirs. Though I have a picture of 954 bars/integrated reservoirs, I sill wonder how it was made to work. Now I have new aftermarket clip-ons to find. This is why its best to just go with a complete front end. If you get any of the spacing wrong it could end in catastrophic failure from brake overheating or bad bearing wear (or both). For me it just isn't worth the hassle now or later when parts wear out. You are so right, but way too late for me now. The thing that I liked was the fact that the original front axle and wheel could be used with a new set of spacers. Much less hassle for me. Stick with it , you will love the difference ! A new bike at a fraction of the cost. My springs & fluid are cerca 1997. What is the simplest fork swap, with good performance gain? Personally I don't have a problem with the VTR fork mechanically, but they certainly are a lot better with some decent springs and damper parts. 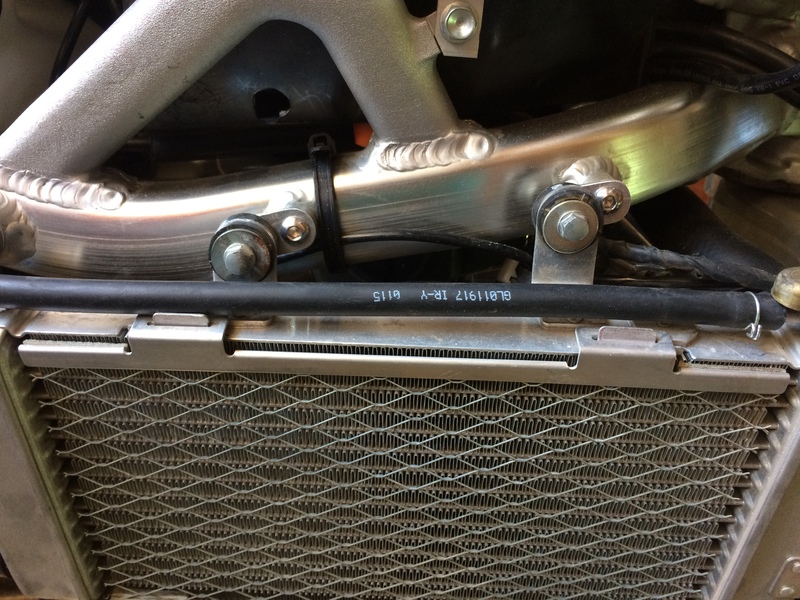 The stock fork is undersprung and has harsh compression damping. I'd suggest you contact Daugherty Motorsports and get a cartridge and spring kit, or do the same with Racetech parts. Daugherty will supply a customised set-up for your weight, whereas you might have to work that out for yourself with RT. Good info, thanks. I had RaceTech in 1998, so I'll check out that option. I am going to get the modded F4i rear shock from Daugherty. Last edited by Kelevra; 08-21-2017 at 11:11 AM. I think if I had to do it again, I wouldn't. Instead would get the forks sprung and valved for my weight and riding style (Daugherty Motorsports) put a fork brace on and call good enough. The bonus of bigger brakes will be lost, but add 954/RC/F4 calipers and radial MC, super duper pads and forget about it. Pretty content with my Brembo radial, and SS lines but figure the F4i calipers will just work better, so I'll prolly go that route. Had good experiences with racetech springs and internals in the past. All my racing stuff I went through GMD computrack in Mass. but I'm not doing anything close to racing these days, haha. 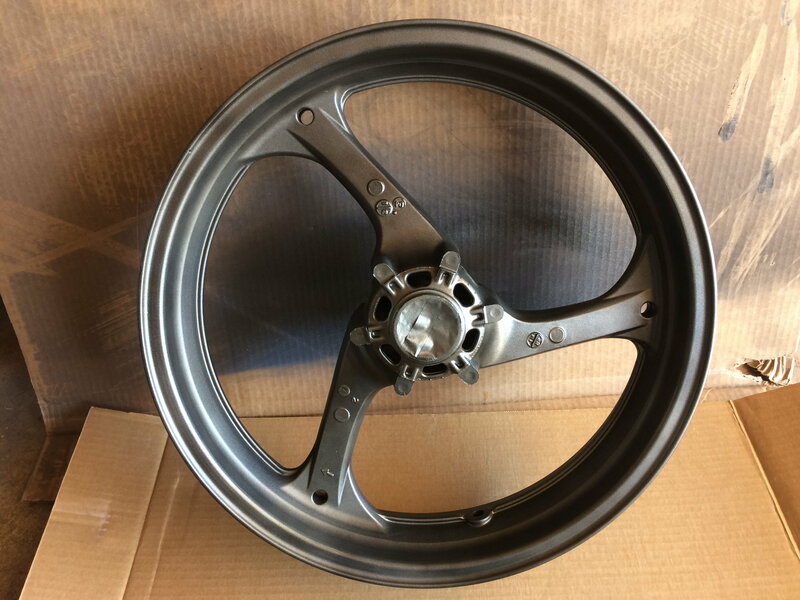 So after a bit of too late research, it looks like the front wheel from an '04-'06 CBR600RR would be a swap in for the SP1-SP2 forks. Use the disks, axle and wheel spacers from the SP. This is not gospel, but looks like it is a good option. Still the question of distance between rotor carrier mounting face across the hub. With the bearings, seals and distance collar being the same as an SP, seems as though it would work. Again, NOT CONFIRMED. 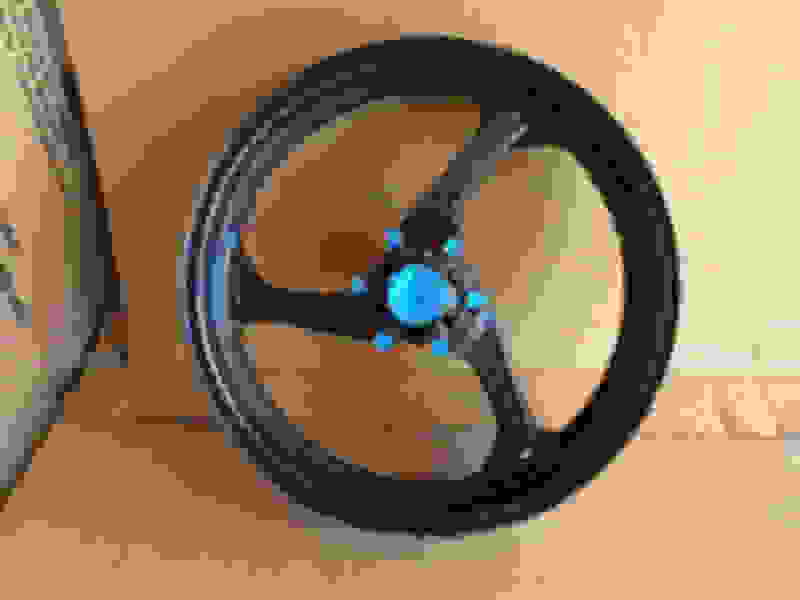 This gives a three spoke front to match the stock SH rear wheel. 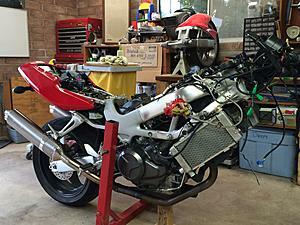 Much better option (maybe) than what I'm doing, which is trying to get a CBR1K modded to match up with the SP1 forks. 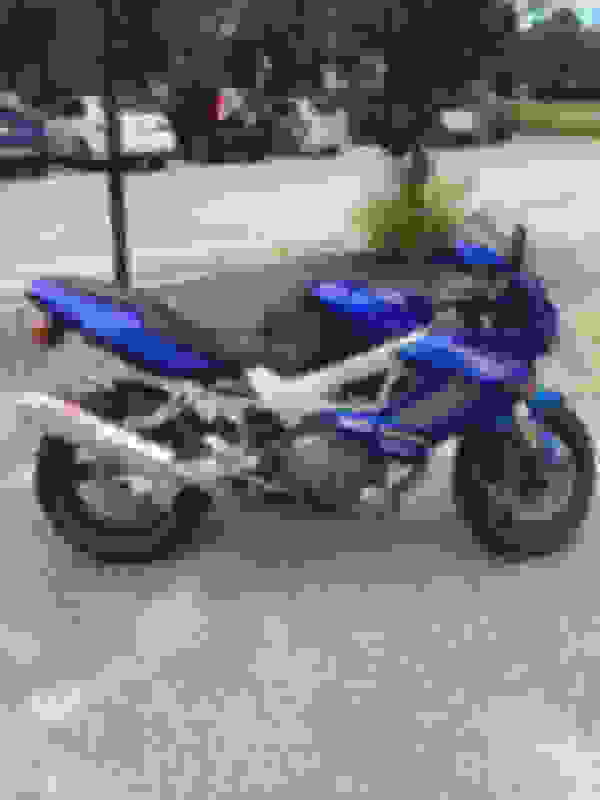 The 600RR is a 22mm axle on a ('03?) '04-'06, maybe other years as well. Didn't go that deep in the parts fiche. Looks like all the RR's and some F4's had 310mm discs. Some of the F models had 296mm discs. In my case I wanted to stay withe the RC disc size of 320mm. Bolt pattern is the same on '01-'06 F4i, '03-'06 600RR, 929, 954, '04-'06 CBR1K and RC. Diameters are different though. Just a post to make the point that there is a bit of inaccurate information (surprise) about wheel swaps floating around the forum. CBR 1000, 929, 954 wheels cannot be used with RC forks (CBR 600 forks also) with just a bearing swap. CBR 1K bearings are 12mm wide and the seal is 7mm wide. The bearings that fit the RC axle diameter are 14mm wide and the matching seal is 8mm wide (there are non OEM seals with a 7mm width). This would leave the seal protruding 3mm. Different spacers would also be needed. The underlying reason for the bearing swap is the difference in axle diameters. RC and CBR 600 being smaller at 22mm than the CBR 1K at 24mm(?) It's larger anyway. Point is; double check and save yourself some frustration. Slowly and very painfully, I'm moving forward. Mostly waiting for the machine shop to get done with the most recent modification to finish putting the wheel on. Feckkk! I do things the hard way. Decided on separate instead of single tabs to move the radiators back. Gives me a bit more flexibility in positioning of the rads over the single piece method. Putting the brackets back on will keep the rads moving around as the two piece mounting tabs are not as secure as a one piece. Since there was no mention of the need to mod the brackets, I'm assuming that those that have moved the rads back just left the brackets off. Thanks to captain chaos for the set of brackets that I cut up. 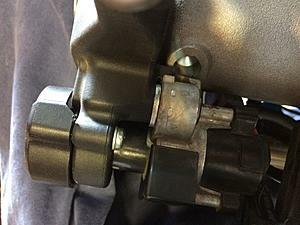 Using the 954 gull wing top triple allowed the steering lock to almost line up with the recess in the neck. A couple of washers to lower the lock assembly and it now works just like stock. You do things the hard way. But its a journey and you need to be true to yourself so that at the end you are satisfied with it. For me most jobs are in a huge hurry since the VTR is my basic transport. Nice to see it done right, not fast. I am putting a cbr front end on today or soon. Will be interesting. While waiting for longer throttle cables from Motion Pro I decided to fix a cosmetic match issue with the CBR wheel. Though most of the original black wheel is hidden by the rotors, I would still know/see it. So after some wet sanding and masking, went at it with rattle cans. Primed, then a couple of coats of Dupli-Color silver wheel paint (will come back and post actual color name and number), then a light coat of Rustoleum Dark Night Matallic. I have a can of 2K matte clear coat on the way from Eastwood for the final finish. Not a perfect match, but close enough for me, now. I like the color better than the stock black. I think I'd paint the rear the same and call it a day. Looks great. Did that same color last year but did it with the tire on the rim but with wood blocks and masking tape. BTW isn't/wasn't this a fork thread? This goes on the end of the forks. Anybody interested in a complete cbr1000rr front end?? It’s currently mounted on my superhawk. 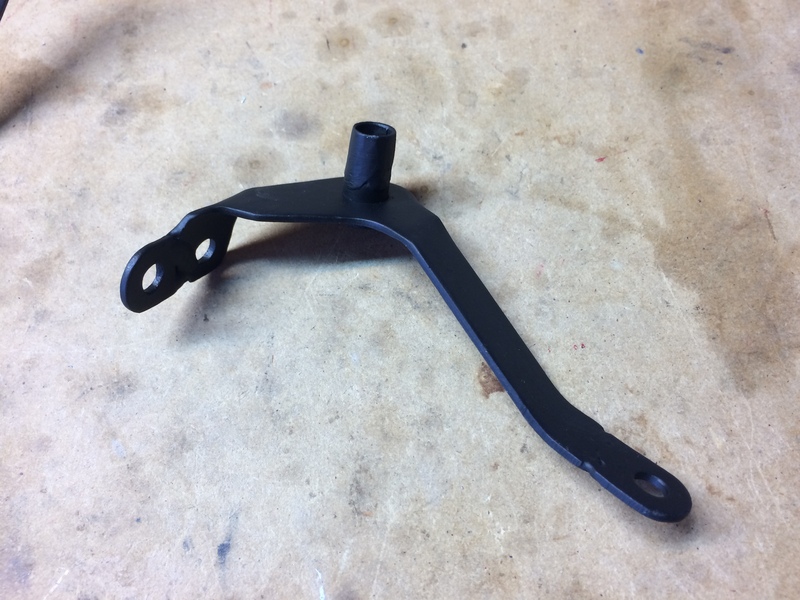 I did 03 CBR954 triple and top clamp with 06 CBR1K forks with wheel. Direct bolt up and used convertibar 50mm clip ons. Easy peasy and no new coolant hoses needed. I even opened up the fork lock notches in the head so I retain factory function. Best mod I’ve done to date! Looks good. That would yield a much more leaned forward riding position. Too much for me as a daily rider. I had to go with the 4" apex riser bars.